2019 race registration opened Saturday, April 13th (Cottontail race-day!). Hope to see a bunch of you again—or for the first time—in 2019! WANT TO PREVIEW THE 1.93-MILE LOOPED COURSE & LAUGH AT THE SAME TIME? As amazing as our 2018 event was (and oh, was it! ), like a fine wine or a Gremlin after midnight, Carkeek just seems to get better (and crazier) with age, time, and rain, so we know the 2019--and 13TH ANNUAL!—edition will be even more fantastic. We'll be there from 7 AM - 7PM SATURDAY, October 26 with endless cheer and endless [candy, yes! and] tasty ultra fare. And as always, we've also got some BIG surprises in the works to properly celebrate the 13th annual running of these terrifying loops. Come run some gorgeous laps underneath some gorgeous fall canopies! Or just come drink copious amounts of coffee with us and help us cheer on the crazies and count their laps with star stickers! Registration will open April 13, 2019 with affordable early-bird pricing, and know this: To limit our footprint and keep our events feeling old-school cozy, we cap Carkeek (& Cottontail) at 50 runners, max, so don't wait too long to sign up! We promise you don't want to miss out on what is sure to be one of your most FUN and memorable fall trail events! In addition to the historically offered 12-hour run, you'll also have the option to sign up for the 6-hour run we added back in 2014 (for those intrigued by the loop course and the great community, but not yet ready for the commitment of twelve hours running epic loops on the Sound). The 6-hour race will have TWO separate and distinct start-times (7 AM and 1 PM), and you'll have to choose one or the other when you register. The 12-hour starts at 7 AM, no matter what, and, as previously mentioned, goes until 7 PM. 12 hours to run and snack and run and snack and high-five folks as you lap, lap, lap! As with all of our races, all proceeds go to local trails. 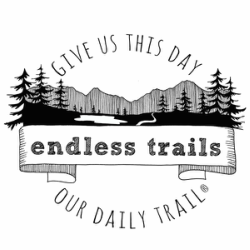 This race is actually an Endless Trails fundraiser! Which means any additional proceeds outside of permit fees and awesome aid will go directly to Endless Trails operating costs. It also means we'll be giving you extra high-fives of gratitude every lap you run. This is a race full of causes: The causes we support, the stairs that will cause you suffering, and the beauty that'll cause you to smile all day. Come join us! In addition to being tough and F-U-N, our races are also low-impact. You won't find any paper products at Carkeek, and we avidly support local businesses [which means nearly all aid and raffle prizes will come directly from the Seattle area]. With gorgeous views of the Puget Sound, varied terrain [rolling trails, steep stairs, a section or two that might generously be called "flat"], and a festive atmosphere, we think this is a race you [and your family, and friends, and well-behaved, leashed dogs] will just keep coming back to - one 1.93-mile-loop at a time. Each loop boasts 436' of elevation GAIN, so it's going to HURT (so good). If this detailed description of the event feels somewhat vague, don't worry—We promise we send out more detailed info to all registered participants as we get closer to race-weekend. But if you're looking for maps or a "detailed course description" you're not going to find that here. Or anywhere. Part of the fun of Carkeek is how low-key and old-school it is, which means we don't sweat the small stuff (and hopefully you don't either!). We hand-make our bibs and count laps with star stickers, so basically we're trying to tell you that you're in for a really really FUN day. That said, the video linked above (and right here, tada!) is a GREAT and comprehensive course preview, so we'd recommend watching that to get an idea of what you're in for come "race"-day. Carkeek is also GREAT training for any sort of tough and technical race (think: the HURT 100, Run Rabbit Run, Fat Dog 120, Hardrock, Western, Bear 100, IMTUF, etc. ), for running longer distances than you previously thought possible, and for making you feel simultaneously so proud and like you want to cry by the end of the day (it's all very confusing, and very awesome). Just like we've done in years past, we're offering a way for you to knock $20 the registration price of either the 12-hour or the 6-hour! Just email us at AllTheTrails@Gmail.com and sign up to bring a tasty aid station food and/or drink to share with your fellow runners (we keep these events intentionally small, so we're not talking huge quantities here). Once you do, we'll give you a code that'll discount $20 off your race entry when you go to register. We always try to have some of the best aid station food around, but we always try to keep things simple (nuts; wraps; homemade soup; fruit, etc.). You can make a local farmer's market stop, and/or grab something you love from Costco/Safeway/your pantry, or you can even bring something homemade! We'll keep a master list of stuff folks are planning to bring, and will maybe even ask you to bring something specific, so we don't end up with too much of one good thing. And we'll keep offering discounted entry as long as we need more aid station food and/or drinks--BUT PLEASE EMAIL US BEFORE YOU REGISTER if you'd like the discount. If you don't want to worry about bringing something to share, no worries! Just register as usual and we promise we'll take great care of you. In addition to being tough and incredibly scenic, this race is also meant, in its entirety, to be FUN. And, as it does every year, it's happening on Halloween weekend, so, as always, we're encouraging runners [as we do every year!] to bring your Halloween costumes for a lap or two or twenty! In fact, we'll be offering additional prizes for costumed running, for anyone who rocks their costume(s) for at least one of their laps throughout the day. [If you want to rock your costume(s) for every single lap for 12 [or 6] hours? We'll support you in that endeavor 100%, and we've got special prizes for you, too.] There will also be prizes for pets in costumes, and for best overall and best group costume(s). We'll also likely be awarding prizes randomly all day long because this is Carkeek, and that's just how we roll. There are a slew of great examples of previous(ly fantastic, runnable) costumes in the slideshow above, and via the links to Glenn's photos (also above). And don't worry: If costumed running isn't really your thing, we promise you'll still love (laughing at people running in costume, yes! and) fall miles at Carkeek with a group of kind, like-minded crazies. Questions? Comments? Favorite Halloween candy?